Posted by mary-admin & filed under Fulfilling Lives, Inner Peace. The 365 day goal may also be something you decide to give up, much like many Catholics do during lent. Examples could be giving up swearing, alcohol, candy or a favorite unhealthy food. The result of your 365 day goal should deliver a positive effect in your life by its exclusion or inclusion — and by your year-long commitment. These 365 day type of goals are important for TWO reasons. First, we get the positive “compounding effect” of a simple discipline repeated over the course of a year. Secondly, we get to experience “discipline” for the sake of discipline. Cultivating will-power brings a sense of control and power, while it also tames the ego. Many spiritual practices encourage a simple discipline practice for this reason. 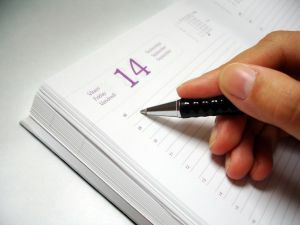 It forces you to make deliberate and conscious choices throughout the year about that single discipline. And, the compounding effect delivers more value than otherwise random follow through. So, it’s a double win. Want some examples of 365 Day Goals to get your creative juices flowing? •	No pasta / No breads / No Ice Cream / No cheese / No dairy / No red meat … or ? You may also quantify your goal differently, to be more achievable, such as committing to working out four or five days a week (on average) for an entire year. The goal ought to stretch you, but still be doable. Don’t feel that you must do ALL or ANY of these…the point is to commit to ONE for a whole year — one that is perfect for YOU. Focusing on too many 365 day goals is counterproductive. Find something that resonates for you…and commit, really commit!! What would be the impact 365 days from now if you…? Some goals become permanent, and others are just a one year commitment. Anything that I start to notice as a pattern in my life, that doesn’t serve me, I like to nip because I don’t like being controlled by something outside of me. One year, Tony Robbins committed to working out EVERY day…and found himself on the exercise bike at 2am on some days. While he got in great shape that year…he also got the power of discipline. And, a great story to share. Have fun with this. Feel free to share with me your commitment for the year, and maybe you’ll inspire other readers by your 365 day goal. Email me mary@lifecoachmary.com.